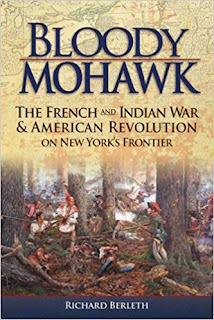 Bloody Mohawk by Richard Berleth. Ok, this was my go to book. So well written, lots of maps, chock full of information. I could not have written my book without it, well really I could have but it would have been harder. Anyway, I love this book. If you are looking for an in depth look at the history of this area and the personalities that shaped it, this is right up your alley. Its not a dry scholarly book that bores you, it pulls you into the history. 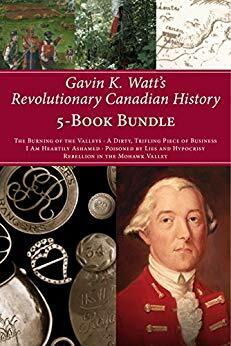 Author Gavin Watts has written multiple books on the Mohawk Valley, specifically during the 8 years of the American Revolution. What I really enjoyed about his books was that many are written from a British/Canadian point of view. So the American Patriots are the enemy and the British and their Tory allies are, well, the good guys. Amazon has a five book bundle of his books which is great value for the money. Don't let the title put you off, this is American history, from a Canadian perspective. The books are well written and include lots of maps, drawings and photos. I found them very informative. 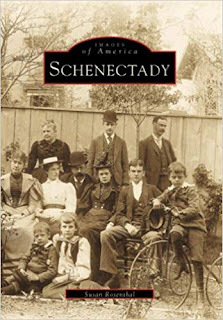 I know most towns have these pictorial books but I especially liked this one on Schenectady. When we visited we stayed in the oldest section of town, the Stockade. This book was very helpful and many of the pictures of old Schenectady are of the Stockade section of town. Schenectady Digital History Archive: http://www.schenectadyhistory.org/index.html this website is the bomb! So much information crammed into its pages. It also has digital copies of two great books, A History of Schenectady During the Revolution by Willis T. Hanson, Jr. (Brattleboro, VT: E. L. Hildreth & Co., 1916) and all four volumes (3600+ pages) of History of the Mohawk Valley: Gateway to the West 1614-1925, edited by Nelson Greene (Chicago: The S. J. Clarke Publishing Company, 1925). Both of these books were enormously helpful. They are broken into chapters and are completely searchable. If you are interested in the genealogy of the area the website also includes the book Hudson-Mohawk Genealogical and Family Memoirs (New York: Lewis Historical Publishing Company, 1911). Three Rivers this website focuses on the three rivers: Mohawk, Schoharie and Hudson. It was started in 1998 and has a ton of information about the area. This is a website that you have to spend a few hours-days poking around on. It has a vast collection of links to other websites, books, etc. Some of the links no longer work, but most are still active. I can't describe it and do it justice, just check it out. http://www.threerivershms.com/newtosite.htm It has not been updated since the 2014 death of its webmaster A.J. Berry. His web address is: http://www.fort-plank.com/ I found Ken to be responsive to questions, he was very helpful. There is a Facebook group: The Colonial Families of Tryon County which is active and promotes the history of the area with a focus on the colonial period and the American Revolution. The group members are extremely helpful and love to share their history. One, Shirley, was kind enough to open a historical site, normally closed, just for me and my husband, so awesome. My book, based on the life of my ancestors who lived in Cherry Valley during the American Revolution portrays life in the 1700s and the realities of war. If you enjoy reading historical fiction this is the book for you! The story follows the life of my ancestor Catherine Wasson and her husband Colonel Samuel Clyde of the Tryon County Militia, hero of the Battle of Oriskany and commander of Fort Plain. The couple made their home in idyllic Cherry Valley just before peace with France was declared bringing an end to the last French and Indian War. But worse was to come and the patriots of the Mohawk Valley bore the brunt of the war with England during the Revolution. Women and children were not spared as the Clyde Family faced the almost daily fear of attack. 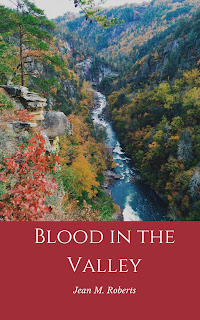 Full of history and the colorful characters of the Valley, its a whirlwind of a read. Do you have a great book or website that should be added to this list? Let me know and I put it up.